MY WIFE’s HUSBAND by Miro Gavran opens Wednesday, March 9, 2011 at 8pm. 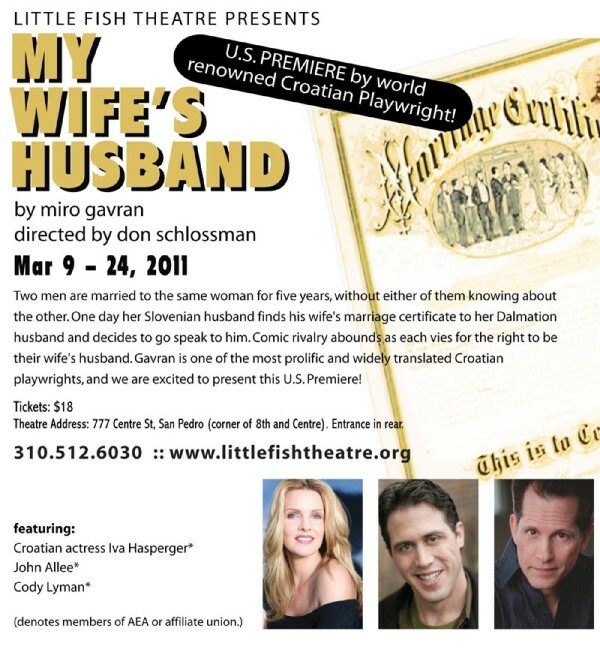 San Pedro, CA – Little Fish Theatre (LFT) is kicking off its 2011 Mid-Week Series with the comedy MY WIFE’S HUSBAND by Croatian playwright Miro Gavran, directed Don Schlossman. A favorite in Croatia, LFT will be presenting the US Premiere of the English translation of the play. Two men (a Slovenian and a Dalmatian) are married to the same woman for five years, without either of them knowing anything about the other. The clever woman keeps house on each end of her route as a train attendant. One day, one of the men discovers a marriage license in the lining of his wife’s coat prompting him to leave his home in Ljubljana to visit this mystery man in Split. Comic rivalry abounds as the two debate who most deserves to be ‘their wife’s husband’. And then SHE shows up. Miro Gavran is a contemporary Croatian author whose works have been translated into 32 languages, and his books have come out in 150 different editions at home and abroad. His plays include over 40 dramas and comedies that have had more than 200 first nights around the world and have been seen by more than two million theatre-goers. Mr. Gavran is the only living dramatist in Europe to have a theatre festival devoted solely to his plays outside his homeland; the Gavranfest has been held in Slovakia since 2003. San Pedro is considered the heart of the Croatian Community in Los Angeles. LFT is premiering this work to honor to its Croatian-American neighbors. MY WIFE’S HUSBAND runs for 6 performances only, every Wednesday and Thursday night at 8pm through March 24, 2011. Director: Don Schlossman recently directed two of the popular pieces in the Pick of The Vine: Season 9 short play festival at LFT. He has also appeared on the LFT stage in Beauty Queen of Leenane and Veronica’s Room. Little Fish Theatre is an Equity Waiver theatre celebrating its 10th Anniversary Season in downtown San Pedro, only minutes from numerous fine restaurants. LFT is the contemporary wing of Shakespeare by the Sea. Miro Gavran 3 premieres in 3 countries in 2 weeks. Latvia, Slovakia and Czech R.